My sister, Mary, asked me to post something about Pop and his microscope, so here goes. Pop had many hobbies. Among them he liked to study things under the microscope. I must preface here that his microscope was as basic as it gets just above a magnifying glass. A mirror reflecting light from the sun or some other external light source is all his microscope possessed in the way of illumination to view whatever was on the slide. That being said, it certainly made it a mobile device that could be used in the house or out on the picnic table. He taught my sister and me how to use the microscope and how to prepare slides. He showed us the wonders and diversity of life along with objects of interest from nature like the difference between sugar crystals and salt. One of the things we did that I found fascinating was to put straw in water in an old mason jar and let it stand for a few days. He placed a drop of the “matured” water on a glass slide and placed a slide cover (a thin square of glass) over the drop without a fixative to spread the drop thin enough to look at what was in it. Inside that single drop of water life had sprung up in the form of tiny creatures. They were busy creatures, too. They moved around eating microscopic bits of algae and such. As days passed we checked on the tiny world of creatures in that jar of straw water and things were rapidly changing in there. New creatures would arrive and older ones disappeared. I could only assume new creatures hunted down the older ones and ate them. After some time had passed watching the evolution of life in the jar, we found that all the creatures were gone having, I imagine, reached the end of life in their world with nothing further to eat. Our parents gave us each a new microscope one Christmas and I loved that mine had its own little light I could plug in and see things more clearly. 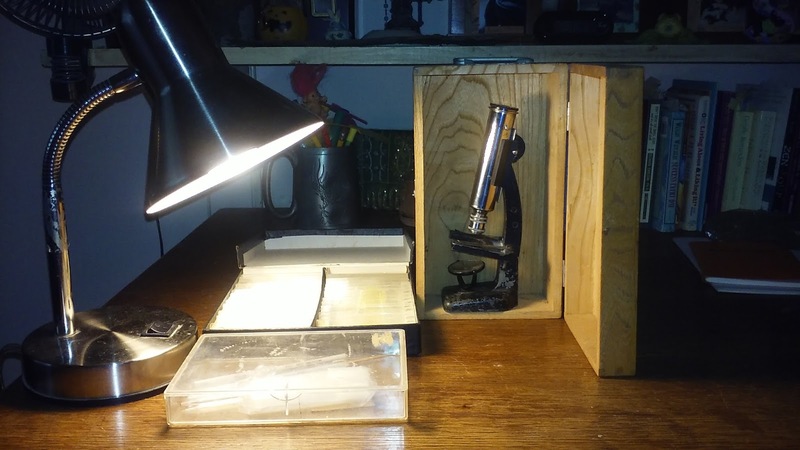 After I left home to go to college and then out into the world, Pop found ways to use my microscope and the wooden box it came in to improve his microscope. 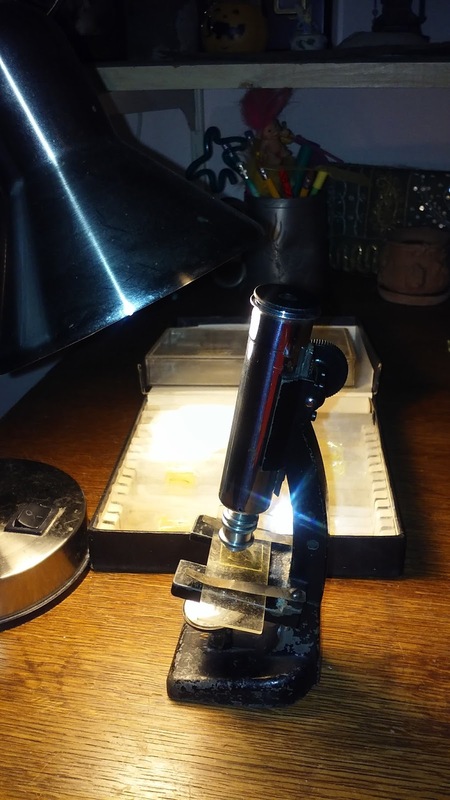 I don’t know what became of my microscope, but years later, Pop gave me his (in the wooden box mine had come in, but transformed to accommodate his microscope.) I still have some of the slides we made together and some pipettes and other tools left from my days at Career Academy. 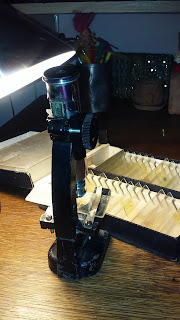 Pop’s microscope is one of my favorite treasures. It warms my heart to have these things that my parents held dear. And I like sharing these childhood stories with all of you. While we're enjoying all the parades and food celebrating Saint Patrick's Day, let's think about keeping our planet green, not for just today, but all the days and years to come. 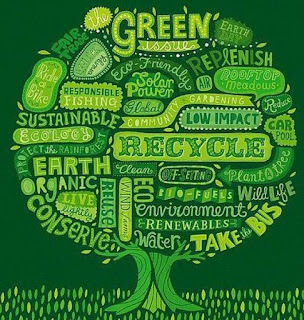 Mother Earth is our home. 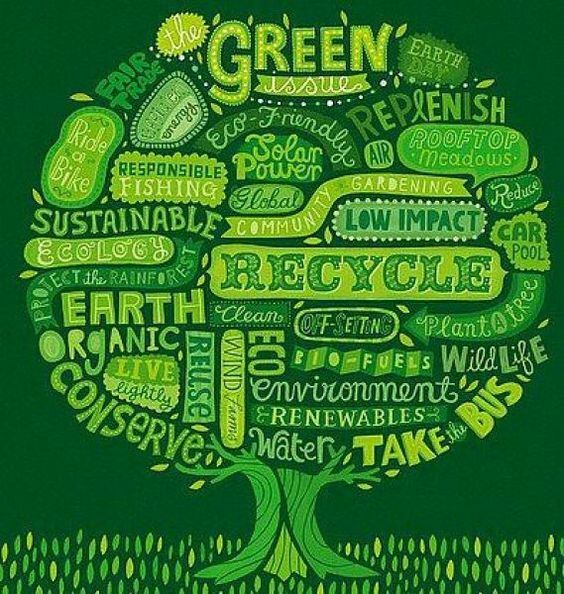 So here is a "Green Tree" loaded with all the things we can each do keep our home safe, happy, and thriving for us and all living things that depend on her. 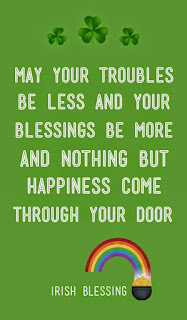 And, in the spirit of Saint Patrick, here is an Irish Blessing for you. March's theme is Beware the Ides of March-kidnapping I present my excerpt of a scene in which Lilith is attempting to escape her kidnappers in Fly Away Heart. There was no choice left. The roaring river was her only hope. 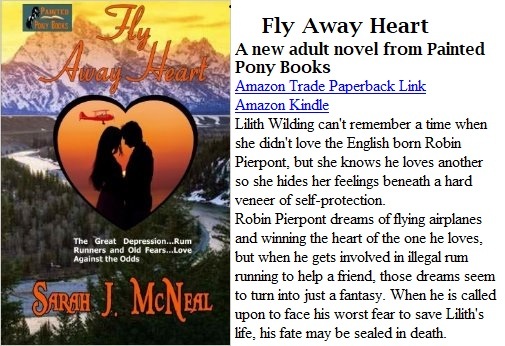 To escape these vile men she would have to take her chances and plunge into the deadly current of the white water. With a deep breath to gather her courage, she dived into the rapids. The icy water took her breath. She never imagined it that cold. Helpless to navigate, the current took her down its dangerous path. The weight of her dress drug on her as she attempted to nudge her body toward the rocky island in the middle of the river. Lilith gulped water and fought against the pull of the current. If she could just get to the rocks, she could keep from going over the falls. Certain death would take her if she went over, but there was no turning back now. Shots rang out and a bullet whizzed past her ear. As she bobbed for an instant above the water, she saw that Edgar had a pistol in his hand aimed at her. He mouthed something at her, but the noise of the rushing water drown out his words. Just as well. She couldn’t get back to the shore if she tried. The current swept her in its cold embrace. Sometimes it rolled her under. She took on water. Her lungs hurt for want of air and the water burned them. Please God, don’t let me die this way. The river dragged her along, pushed her under and turned her over and over in a mad rush for the falls and she couldn’t stop it. A picture of Robin came to her. His voice seemed to command her. Don’t give up. Don’t give up. Don’t give up. I binge-watched “Call The Midwife” on Netflix for days…and nights until I was on a zombie TV hangover. For those of you who know nothing about this series, it’s about nursing in London, England at the end of World War II when the country first instituted National Healthcare through 1962. I loved this series and I didn’t think I would. When I left nursing in the Emergency Department in 2009 to retire, I was burned out on nursing. After the medical center bought out the Sisters of Mercy in 1995, the demand for “excellent” care and the decrease in nursing personnel to carry that out made most nurses, including me, and especially veteran nurses who had been nursing for more than 10 years, feeling inadequate, worn out, and dissatisfied. On top of that, in order to cut costs on personnel and save money on wages, insurance, 401 K matching, and so forth, the administration decided all nurses were to work 12 hour shifts limited to 3 days a week and were dedicated to allowing no overtime. Consequently, patients were herded in and out of the department in record time. Quality care became a thing of the past. It got worse after I left according to some of my colleagues who still worked after I left. So, when I watched this series about nurses dedicated to their patients, delivering the kind of care we used to give in the early years of my career, well, it took me back to those days when I loved my job. I actually woke up in the morning feeling a sense of purpose and eager to get to work and make a difference. 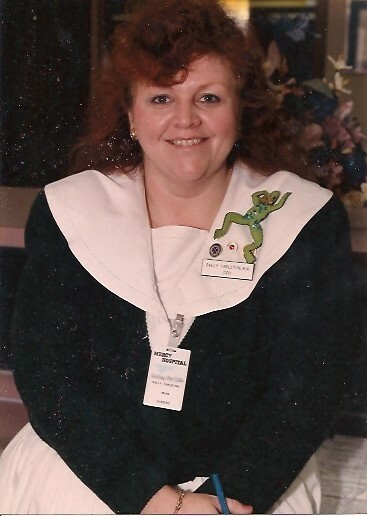 My sister, who is also a retired nurse who specialized in psychiatric nursing, was on the same page I was about the change in nursing care then and now. I had the added pleasure of working with the Sisters of Mercy at Mercy Hospital. We changed sheets every single day and at night we changed the draw sheet (a thing of the past) and gave the patients a back rub and refreshments before their bedtime. We had time to do these things and it was encouraged and expected that we would CARE about those patients and spend time with them. And, for me, I had the addition of the nuns and a resident priest who not only administered to the patients, but to the staff, as well. Father King held mass every day in the chapel and he made rounds at every nurse’s station and patient’s room. We were encouraged to go to classes and some of them were expensive, but we were allotted the money to take courses that would advance our knowledge and level of care. I went as far as Virginia Beach to take a 2 day seminar from Dr. Marriot, a well respected expert on EKG interpretation, to learn how to interpret electrocardiograms. It was fascinating and enlightening. Later on, I even taught 12 lead EKG interpretation and heart rhythms to nurses in the coronary care internship program. I loved that stuff. And I loved those patients and their families. Things have changed. The Sisters of Mercy could not compete in the financial world medicine had grown into and sold Mercy Hospital to Carolinas Medical Center. New technology has saved numerous lives through the advancements made in medicine like stents and angioplasties along with so many other medicines, treatments, and diagnostic procedures. Nurses aren’t taught to give tender loving care to their patients anymore the way we were. It’s all about cost effectiveness and time management. But I will always remember with the greatness fondness that time I spent delivering care in the same way those nurses did in “Call The Midwife”, and the support and care I received from the Sisters of Mercy and Father King. By the way, I saw in the news yesterday that the shortage of nurses is so great now hospitals are offering 5 digit sign on bonuses as well as benefits, better hours, and great pay. It’s a hard, often grinding job, but maybe things are changing. Maybe they are coming full circle now and nurses can give the kind of care that nurses and patients both want. 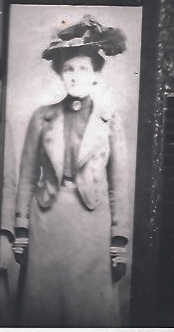 I was named for my maternal great grandmother, Sarah Jane Long. She was married to Peter Long, a musician and band leader. 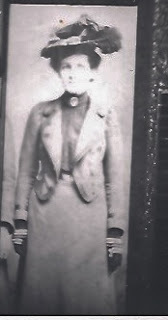 I know very little about my great grandmother except that she remarried an Englishman was not kind to her or her five children (3 boys: Harry, George, and King and 1 girl: Carrie, who was my grandmother). She and her children all died of tuberculosis except Harry and my grandmother who was still just a kid when her mother died. Both Harry and my grandmother had tuberculosis, but lived. I met Harry Long when I was a child. He seemed kind and robust. In a family of all brothers in a time and place where only males were treasured, I am certain my grandmother had an unhappy childhood. She was expected to do the cooking, cleaning, and sewing on her own...such was the expectation of girls in those days. I only have 2 pictures of Sarah. 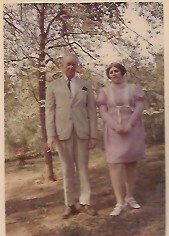 One is a charcoal rendering of her around the age of 12 and this picture I posted of her as an adult in her finest Sunday clothes. I wish someone had had a journal back then and had written something about Grandmother Sarah and what their lives were like back then. 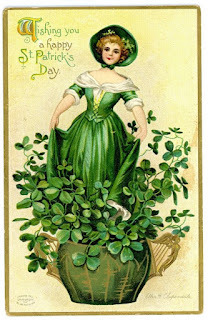 Do you have a family namesake? Did anyone in your family keep a record of the family? Do you journal about events and our time in history? 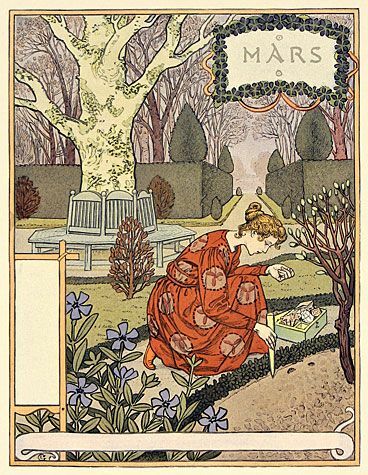 March’s theme is , Beware the Ides of March. 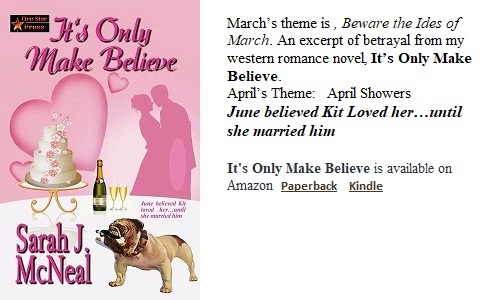 An excerpt of betrayal from my western romance novel, It’s Only Make Believe. I like March. It's the divide between Winter and Spring. 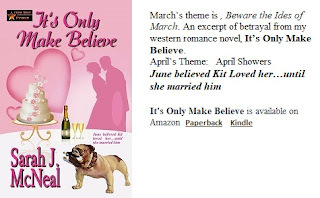 No matter how windy and cold it may be in the beginning, I always know it's going to end well--and I like happy endings. 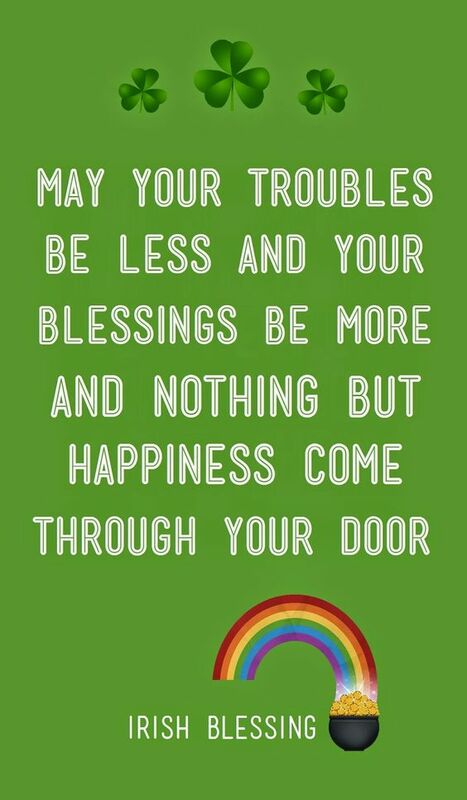 I realize that that is true of the south where I live. Some of you may still have cold weather and snow. Still, on March 21, Spring officially arrives and at least there it that bright ray of hope that things are about to change. The Earth is going to come alive again. So, I guess you could say March is the month for hope.